Super atoms; single-atom catalysts; atom hybridization. The Technical University of Munich (TUM) has devised what it calls a super atom, a technology that could one day enable a new class of catalysts. TUM developed a cluster made up of 55 copper and aluminum atoms. The cluster looks like a crystal, but it actually has the properties of an atom or a heterometallic super atom. 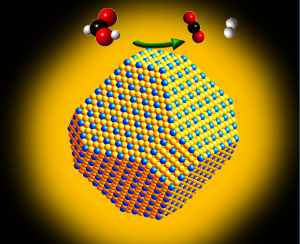 The super atom could one day be used to develop more cost-effective catalysts. In vehicles, for example, platinum is used as a catalyst, which speeds up chemical reactions and cleans exhaust gases. Besides platinum, the industry is exploring the use of other and lower-cost materials for catalysts, such as iron, copper and aluminum. Combining these metals is challenging, but TUM may have solved the problem. In an argon atmosphere, researchers from TUM combined copper and aluminum atoms that were bound to organic compounds in a test tube. Some 55 copper and aluminum atoms were arranged to form a crystal. The surface consisted of 20 equilateral triangles, sometimes called icosahedrons. 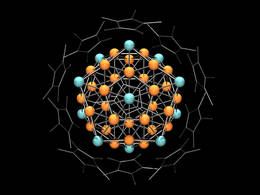 All told, some 43 copper atoms and 12 aluminum atoms organize into a structure that resembles a single metal atom. “Many groups of researchers are experimenting with new material compounds made of lower-cost base metals such as iron, copper or aluminum. However, so far nobody has been able to predict whether, how, and why these catalysts react,” said Roland Fischer, a professor at TUM, on the university’s Web site. “Our goal was to bridge this gap and to create the basis for understanding a new generation of catalysts. 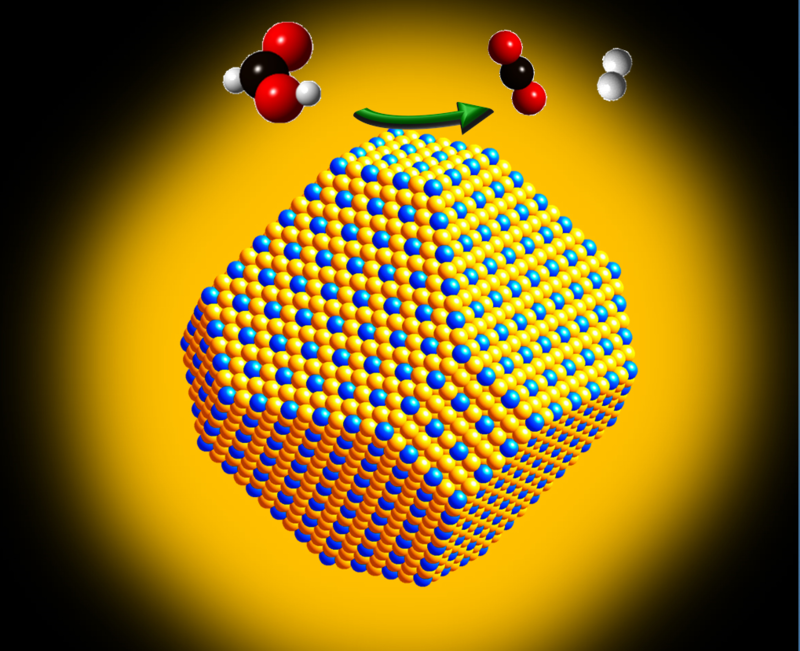 Dalhousie University and others have combined gold and platinum to form a single-atom catalyst, resulting in a nearly 100-fold increase in efficiency over today’s platinum catalysts. In vehicles, platinum catalysts degrade over time. Carbon monoxide molecules begin to bond in systems. They block the platinum from the required reactions. Enter the single-atom structure using gold and platinum. The single atom structure maximizes the surface area of platinum, while gold creates the properties of an alloy. Researchers worked with three Canadian Light Source facilities at the University of Saskatchewan to understand and test their alloyed catalysts. “The magic happens because of the alloy. Think about iron: it very easily gets rusty in the air, but if you have an iron alloy, like stainless steel, its properties are totally different,” said Peng Zhang, a professor at Dalhousie. “Gold is a first step to show the concept. We now want to look at other, less expensive metals, which will make this more usable for industry,” said Zhang. The Tokyo Institute of Technology has developed a way to blend metals with precise control, enabling new and advanced functional materials. The approach, called atom hybridization, is a way to develop multi-metallic clusters. Multi-metallic clusters, which are composed of three or more metals, exhibit intriguing properties. It is challenging to blend more than four metal elements together. But researchers from Tokyo Institute of Technology has developed an atom hybridization method, which in turn can enable precise multi-metallic clusters with more than five metal elements. To make these clusters, researchers developed a pattern or so-called dendrimer template. A dendrimer a synthetic polymer with a branching, treelike structure. This template assembles and controls the number of atoms in the structure. Researchers demonstrated the formation of a five-element cluster composed of the following elements—gallium (Ga), indium (In), gold (Au), bismuth (Bi) and tin (Sn). They also developed a separate five-element cluster using iron (Fe), palladium (Pd), rhodium (Rh), antimony (Sb) and copper (Cu). On top of that, they developed a six-element cluster consisting of Ga, In, Au, Bi, Sn and platinum (Pt).